New Delhi, Jan 11, 2019 : With its legislation on a 10 per cent quota for the general category poor in jobs and education getting parliamentary backing in the run-up to the Lok Sabha elections, the BJP-led government is now exploring the possibility of providing direct benefit transfers to those below the poverty line (BPL) through a universal basic income (UBI) and for farmers through direct investment support, reported Yahoonews. According to sources, the government may announce a UBI of Rs 2,500 per month initially to families below the poverty line. The money would be directly transferred to this section while ending other sops such as food and LPG subsidy to them, the sources said. The UBI dole is expected to take care of half the nutritional requirements of a family of five in rural areas and one-third requirement of those who make the urban poor. The government is expected to budget around Rs 32,000 crore for April-June 2019. Sources said the actual number of beneficiaries would depend on the funds that the Reserve Bank of India transfers to the national exchequer. Persons below poverty line are estimated to be 27.5 per cent of the country’s population. The 2017 Economic Survey had flagged the UBI scheme as "a conceptually appealing idea" and a possible alternative to social welfare programmes targeted at reducing poverty. The UBI was signalled in the BJP manifesto for the assembly elections in Rajasthan where the party said it would arrive at the income figure "after taking into consideration (the beneficiary’s) income from various sources and the government benefits (he receives)". For the farmers, who comprise 47 per cent of the country’s population, the government is considering an adaptation of Telangana’s Rythu Bandhu scheme where farmers tilling less than an acre of land would be given Rs 4,000 per acre, or a proportion thereof depending on the size of land holding, for each of the two cropping seasons - Rabi and Kharif. The money for transfers to farmers would be shored up by discontinuing the subsidies on fertilisers and seed, the sources said, indicating that a clear picture of the scheme would emerge in July - the start of the cropping season. Transfers to farmers would be dispensed with after an updation of land records with recognised tenancy by the state to ensure that it does not go to the landowner. The states, in turn, would be encouraged to establish lease farming as an integral part of index of Ease of Doing Agri-Business. The government is also considering the possibility of providing interest-free loan up to Rs 1 lakh for these farmers with landholding below one acre. 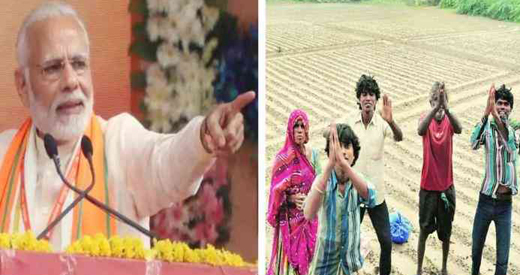 The two-pronged strategy is expected to take care of the small land owners as well as that of the tiller-farmer which voted out the BJP in the Hindi heartland states of Rajasthan, Madhya Pradesh and Chhattisgarh.